Yabusame Houlen (鳳聯　藪雨, Houren Yabusame) is a ditzy strange person who has been given the job as the protector of Mugenri, having the power to cross into other dimensions. They are one of the main protagonists of the Len'en Project and a playable character in all games. Yabusame is described as a weirdo who is plain and boring, as well as a thoughtless idiot. They often make bizarre and apparently nonsensical remarks and sometimes seem to overlook the obvious, leading to everyone thinking of them as stupid. However, at other times they'll reveal an extremely perceptive side and will also sometimes display an extraordinary level of knowledge. For example, in Evanescent Existence, they were the quickest to identify the culprit as Tsurubami Senri. They're also known for their bizarre taste in food (such as eating raw salt). They seem to be cheerful and friendly to others, prone to giving them nicknames. Although it's said that they go to solve incidents tasked by the Senri Shrine without understanding them, they're a person who somehow gets the job done regardless. Yabusame can cross dimensions and get in everyone's way. During Evanescent Existence, instead of being spirited away by Tsurubami Senri, like the others, they arrived in Mugenri by crossing over to the other dimension. They commonly use this ability to teleport the danmaku in front of them and zooming in to replace it. Despite the incredible potential of this ability, they're too much of an airhead to consider its implications. Since Earthen Miraculous Sword they've been given a "two-dimensional cloth" by Tsubakura Enraku, so that they don't fly off into another dimension on a whim. Yabusame's dimension-crossing ability extends to the point where they can break the fourth wall, as proven in Brilliant Pagoda or Haze Castle's tutorial mode featuring them and Tsubakura explaining the mechanics of the game: while Yabusame claims that they and Tsubakura are "parallel" versions of themselves, Tsubakura quickly remembers that Yabusame possesses the ability to cross dimensions, being cut off before they can point out that the "parallel" Yabusame is most likely the real one. The most common application of Yabusame's dimension manipulation abilities is opening "gaps", which act as portals between two places. They're able to use them for their attacks or simply to store things, from legendary weapons (claims to own the Mjolnir) to food (Blue Hawaii sauce). Yabusame refers to these gaps as "pockets". Their full name is Yabusame Houlen (鳳聯　藪雨). The kanji in Yabusame (藪雨) means "grove" and "rain" respectively. Although it's spelled with different kanji, Yabusame is also the Japanese word for the Asian stubtail, a type of bird. It coincidentally can also refer to Japanese horseback archery when written with the kanji 流鏑馬. The kanji in their family name Houlen (鳳聯) literally means "phoenix" and "link" or "group" respectively. Throughout the Len'en Project up to the trial version of Brilliant Pagoda or Haze Castle, Yabusame's surname has always been romanised as "Houren". However, this was rectified to "Houlen" in the trial version of said game. It was further confirmed by JynX that this was the intentional romaji since the very start of their development, but they forgot to keep it in mind, and a partial reason to this is that it reflects the name of the series: Len'en Project. 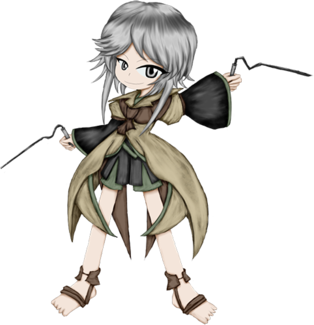 Yabusame has been shown to have silver eyes and short silver hair with long locks. They dress in black and green clothing, covered in a light brown coat adorned with a brown scarf-like cloth tied together at the front. In the first two games, they wear light brown shoes, in the third game they are barefooted and hold a bug catching net and in the fourth game, they wear brown, sandal-like straps around their feet. Their boss sprite in Brilliant Pagoda or Haze Castle also shows them wielding a pair of dowsing rods. Tsubakura is spirited away from the Outside World to a strange land called Mugenri, so their friend Yabusame becomes worried and uses their power to cross dimensions in order to search Mugenri and find Tsubakura. Along the way, they find out that all their allies and acquaintances are trapped in Mugenri as well, having been convinced that if they defeat Yabusame, they'll find a way to escape. After defeating them, they find that Tsubakura is acting very strange and is talking about a "prize" if they defeat everyone. When they defeat Kuroji Shitodo, they tell them that the answers are in "a sun that casts a shadow". Unfortunately for them, after arriving, they find out that the annoying Clause has reached first and believes that if they defeat Yabusame, they'll gain more power. Yabusame defeats them and reaches the mysterious sun, allowing them to enter Mugenri. At Mugenri, the sun that casts a shadow turns out to be a portal to the Senri Shrine. After dealing with Clause again, they are transported to the Mugenri Barrier and find the true mastermind, Tsurubami Senri, a priest who has been impersonating Tsubakura in order to test their powers, since they want a strong person to replace them. Annoyed, Yabusame defeats them, but soon realises that the real Tsubakura has already defeated Tsurubami before. The priest was considering for Tsubakura to be their replacement, but after witnessing Yabusame's potential, they hand both of them their job as a youkai exterminator. After that, Yabusame and Tsubakura settle in Mugenri, since Tsurubami doesn't know how to transport them back home. Shortly after settling in Mugenri, Yabusame and Tsubakura live a carefree life at the shrine until autumn, when mysterious thick clouds covered the land. The familiar of the shrine, Jinbei, forces one of them to go, so they decide on a game of rock-paper-scissors. Yabusame loses and is forced to resolve the incident. After dealing with a few youkai, Yabusame finds themself in a ritual chamber, where Adagumo no Yaorochi and their partner Sukune Katano are. The two were gathering the spiritual energy of the weather to restore a replica of the Tasouken. Realizing that the isis actually the Sword of Kusanagi, Yabusame tries to flee only to be attacked by Yaorochi, who wants to put their new sword to use. However, after Yaorochi is defeated, the sword attacks Yabusame on its own. Fortunately, the clay vessel was too much for the Tasouken and it stopped. After everything was cleared, Sukune reveals that the clay replica is actually a sword-shaped bottle opener, much to Yaorochi's chagrin. In the end, Yabusame drinks some sake with them. Days later, the clouds return to Mugenri. Drunk after a party with their new friends at the shrine, Yabusame goes to investigate. After dealing with an empowered Lumen Celeritas, they encounter the orochi Adagumo no Saragimaru, Yaorochi's younger sibling. They want revenge for having defeated their sibling and ruining their happiness, so they lured them into a trap. Yabusame is unable to understand, but attacks them anyway. After Saragimaru is defeated, Yabusame invites them to drink together. There is a long winter that is out of season and a sudden flow of spirits, so Jinbei forces Yabusame and Tsubakura to head out. Shortly after, Yaorochi and Sukune visit the shrine and they decide which team will resolve the incident. After dealing with a few youkai in search for answers, they arrive to the Frost Cavern, where they bump into Yaorochi and Sukune, who tell the humans to go home as they are more interested in the mastermind's identity rather than the long winter. Yabusame and Tsubakura ask them to resolve the incident together, but the youkai refuse. Later, the two bump into a strange road, where Taira no Fumikado was trying to collect spirits for their resurrection ceremony to resuscitate the vengeful spirit of Taira no Masakado and store him in their homunculus body. After defeating them, they find out that all the spirits are attracted to a certain location. They end up in the Withered Grove, where they find a newborn chimera soul, who is the avatar of the soul-eater flower Harujion. Yabusame gives them the name of Shion. Shion can sense people's minds by smelling them, and is particularly interested in Tsubakura because they have a blank, neutral soul, wanting to consume it. Realizing that the Harujion was causing the long winter, they defeat Shion. In the end, Yabusame and Tsubakura return to the Senri Shrine, bringing Shion with them, much to Jinbei's chagrin. Shion indicates that they were attracted by the essence of the shrine and that they're still interested in consuming Tsubakura's soul. It's revealed that the spirits came to Mugenri because of a hole in the Mugenri Barrier that separates the land from the Outside World. The hole was caused by Lumen, during the Clouds Incident and Tenkai Zuifeng was tasked to repair the hole, but is taking too long. Yabusame and Tsubakura go to confront Tenkai, while the latter is curious if the two are strong enough to replace Tsurubami as protectors of Mugenri. On the way back home, they are ambushed by Sese Kitsugai, a youkai they had defeated at the beginning of the story. Sese absorbs the spirits the heroes had been recollecting and transforms into a much more powerful form, but they are still defeated and the spirits leave their body. The Shitodo siblings were attacked by a mysterious person, so they go to the Senri Shrine to Hooaka's injuries and inform Yabusame and Tsubakura about the words "The mirror of Heaven shall split". Tsubakura mistakes the term and believes it will rain free sake, so they drag Yabusame and a released Shion to go with them. In all routes, Yabusame and the others deal with a few youkai and some of their human aquitances, attacking everyone they can find in order to get information for the sake. Everyone else warns them about an upcoming war between the Dragonfly Army and the Capital City, but Yabusame and the others don't pay attention to it. At the end of the Brilliant Pagoda or Haze Castle routes, Tsubakura, Yabusame and Shion do find out more about the war and they're scolded for it (since they could have prevented it instead of playing around and searching for sake). In the end, they meet Suzumi Kuzu, the one responsible for attacking the Shitodos earlier that day and who said the words about the "The mirror of Heaven shall split" in order to lure Tsubakura. Suzumi reveals their intention to make Tsubakura's life a living hell and after a hard fight, Suzumi erases their memories again. Yabusame is the only one who remember the whole affair, but is quickly dismissed by Shion and Tsubakura, believing that Yabusame is just being ditzy as usual. Yabusame is set to be a playable character in Book of the Cafe. In a battle stage prototype, they appear with an ability to throw fire. Yabusame has co-operated with many other major characters, but is generally not close to them. They and Tsubakura Enraku have been friends since long ago, but being gullible and slow, Tsubakura tends to pick on them a lot, much to Yabusame's chagrin. Yabusame in the background of the title screen of Brilliant Pagoda or Haze Castle. ↑ Yabusame's second card from Evanescent Existence. ↑ Same name as Yabusame's bomb (次元剥離), though written in simple hiragana rather than kanji. ↑ A variation on Tsubakura's third card from Evanescent Existence. Some of their spell cards are similar to those used by Yukari Yakumo , since their powers are based on dimensions. They like giving people nicknames, sometimes to show fondness (like Tsubakura) or because they don't remember their names (like Saragimaru). Yabusame's theme references M-theory, the theory that combines all the different types of super-string theory. For some reason, Yabusame is the only character who is immune to Suzumi's memory-erasing powers. JynX created a poll on Twitter to revealing some information about the Len'en Project, with one option having the inspiration of Yabusame revealed. However, it wasn't voted for. Their sudden disappearance to Mugenri along with the rest of the Evanescent Existence cast is known to have made a huge news story in the Outside World. ↑ JynX's Twitter: "It's more or less for that reason. However, the truth is that I inadvertently forgot I had "Houlen" in mind from the early stages of development, and I rectified that with BPoHC. Therefore, the romanization up until BPoHC's trial version is incorrect." This page was last edited on 13 November 2018, at 09:42.